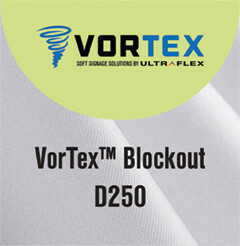 VorTex Blockout D250 is a 100% polyester woven fabric with a smooth print surface. Its unique white, black, white triple layer construction makes VorTex Blockout D250 almost completely opaque. Designed for direct dye-sublimation, Latex and UV processes.